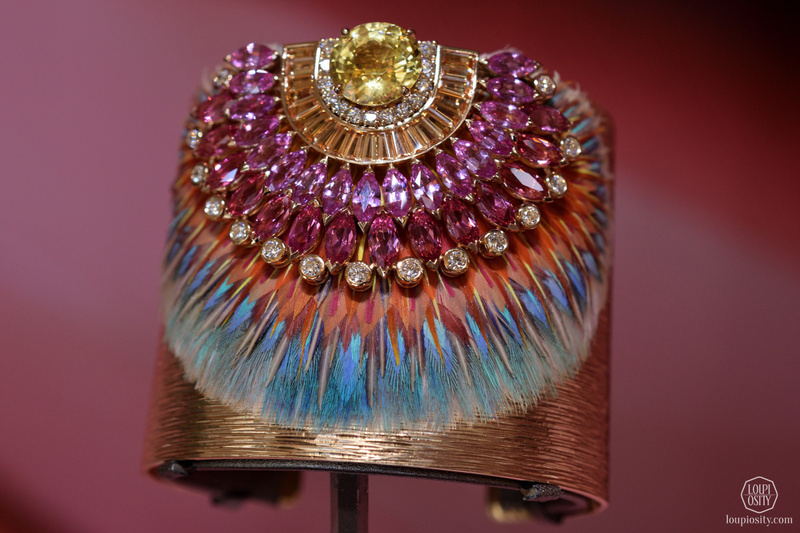 The Paris Fashion Week reveals not only haute couture creations but the finest examples of high jewellery accessories, too. 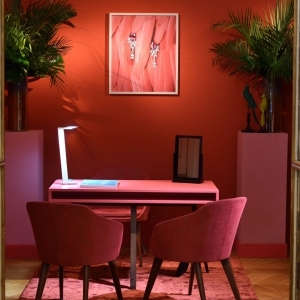 The busy and immersive vibe and the colourful Parisian bustle make the show a true finale to the long preparations undertaken throughout the year. 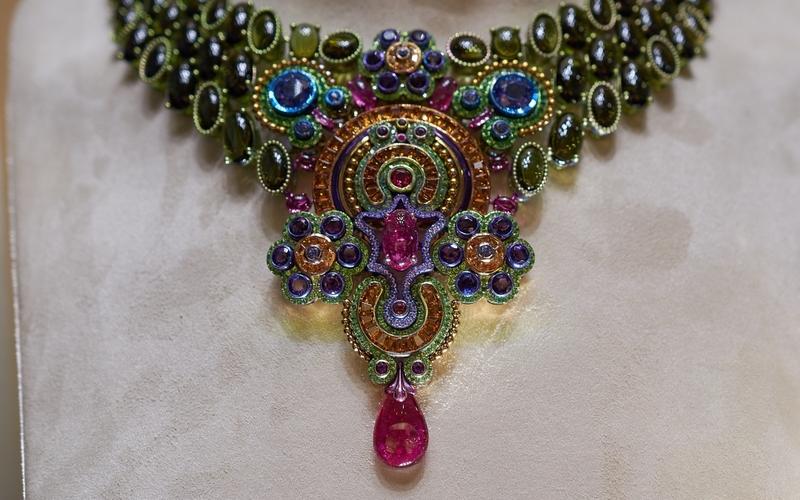 To see the peaks of jewellery craftsmanship in such setting compares to nothing else. 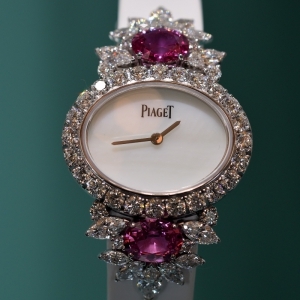 Piaget has been a regular presenter of high jewellery at the Paris Fashion Week. 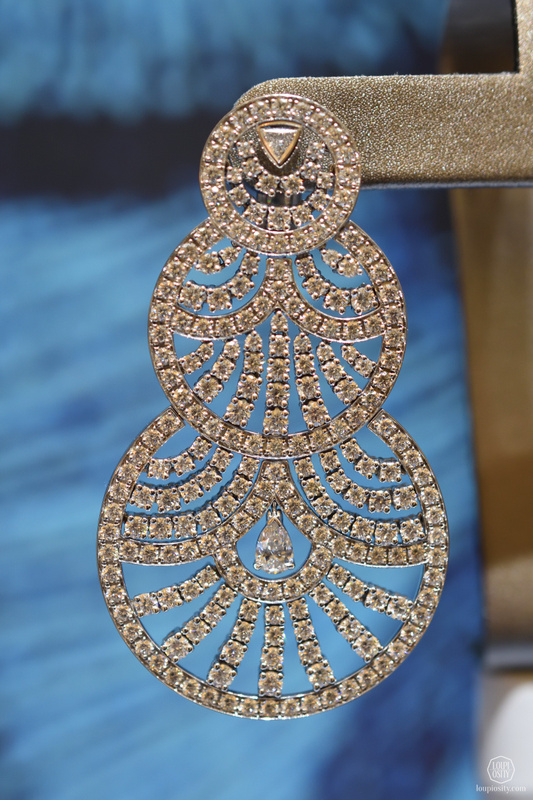 This year artisans were inspired by the favourite season of many, the sunny summer. 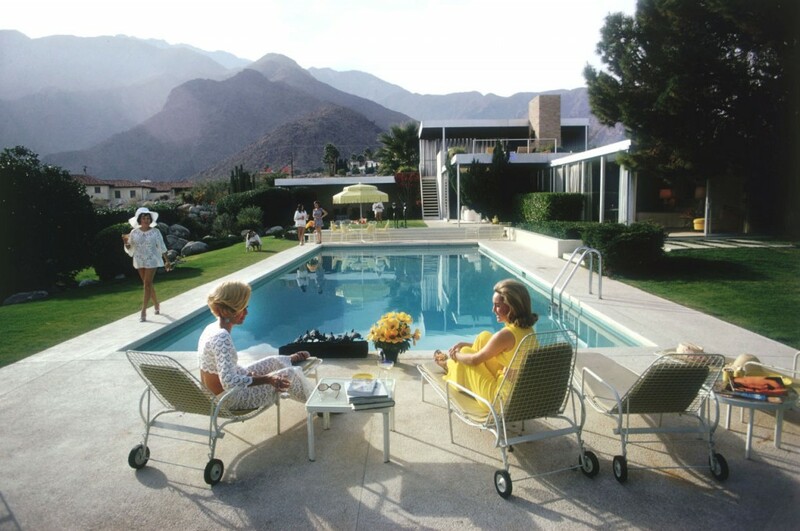 In fact, the Californian summer in Palm Springs to be more precise. 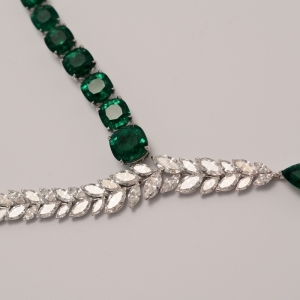 Palm Springs is a desert city in Coachella Valley in Riverside County, which became a chic resort in the 1900s and gained popularity among movie stars in the 1930s. 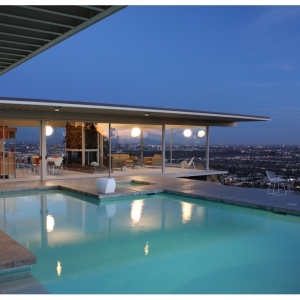 The city is also famous for its mid-century modern architecture and design elements. 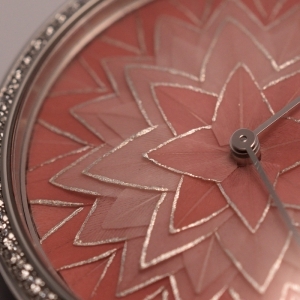 This style is rooted in the aesthetic concept of the German Bauhaus. 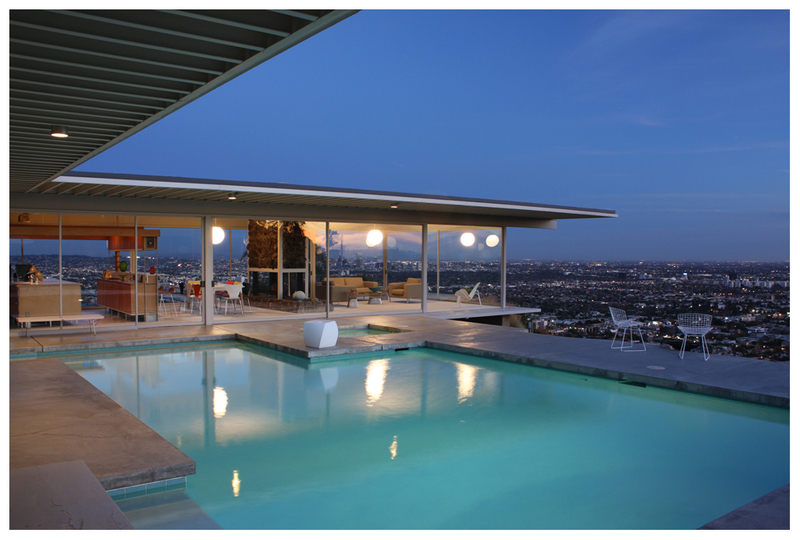 The visionary modernist architects designed sleek and contemporary buildings that have embraced the desert environment. 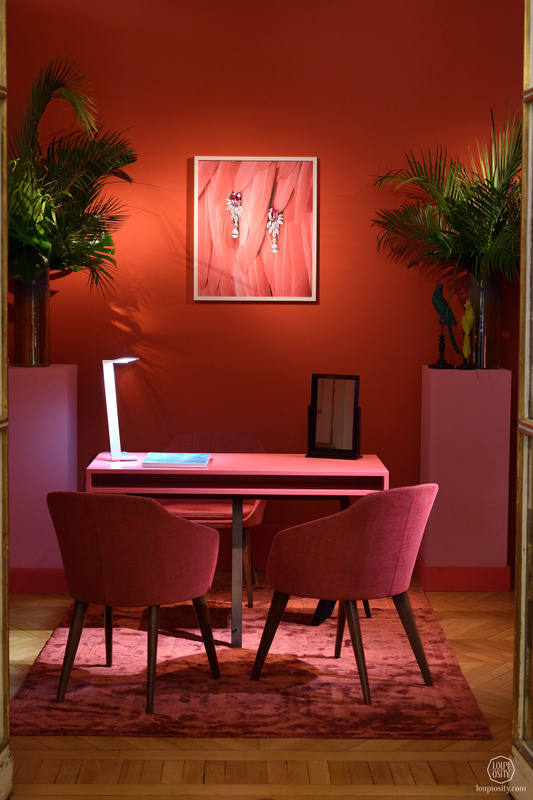 Large glass surfaces, clean lines, the special indoor and outdoor spaces and the colours used created a new style, called Desert Modernism. 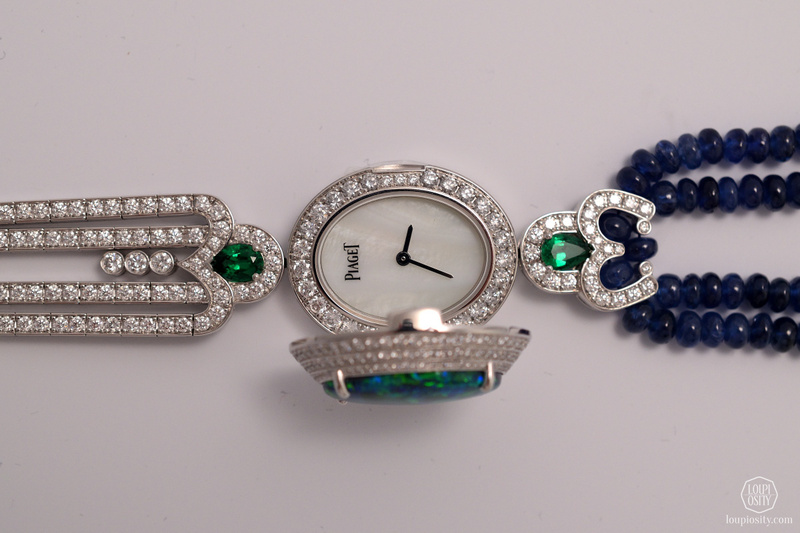 Piaget reinterpreted the Palm Springs’ shapes, colours and shades and the sunny atmosphere into 150 great jewellery pieces in 2016. 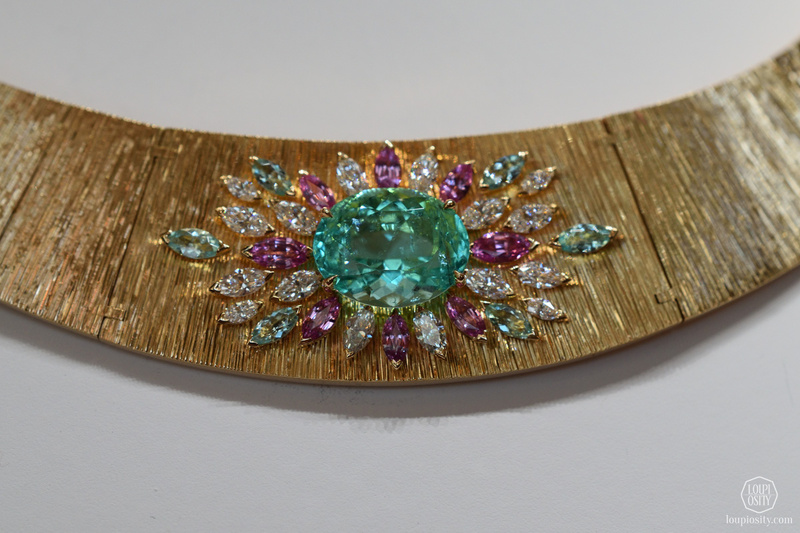 The collection is divided into different parts: evoking the gold of the sun, the blue, green and turquoise of the pool, the feathers of the flamingos and parrots and the lush green of the palm trees. 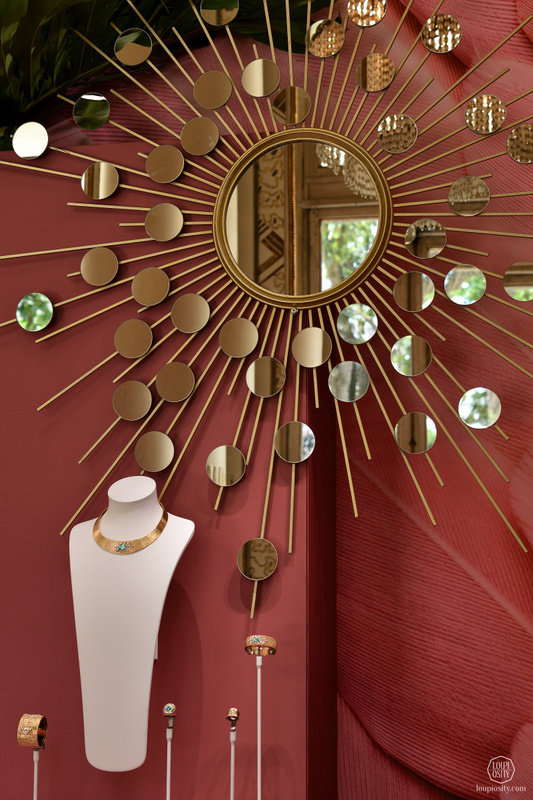 The Maison set this mood in the Hôtel Potocki and its garden during Haute Couture Fashion Week. 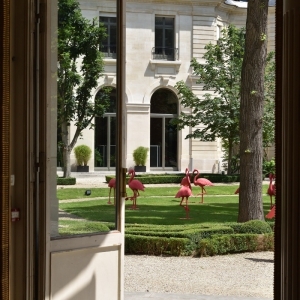 The Hôtel Potocki, located at 27 Avenue de Friedland in the 8th district of Paris, was rebuilt in 1884 by the architect Jules Reboul (the original dates back to 1857). 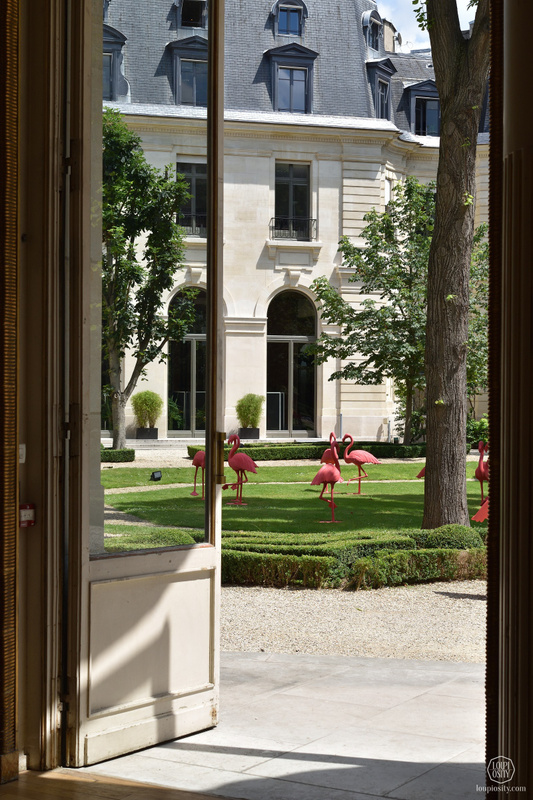 The town palace is designed in the neo-Louis XIV style. 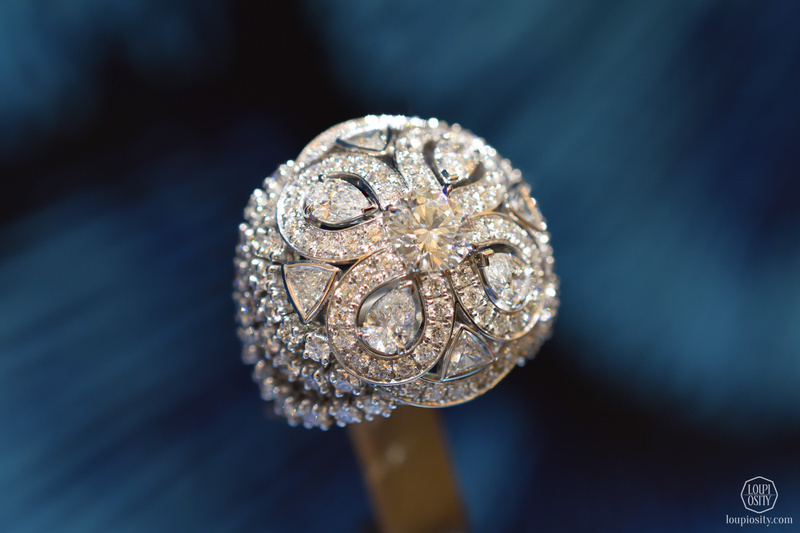 The building was purchased by Count Gregory Potocki at the end of the 1800’s. 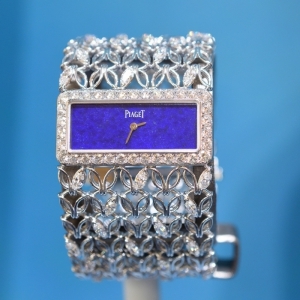 His family was admired in Paris for their remarkable generosity and charity works. 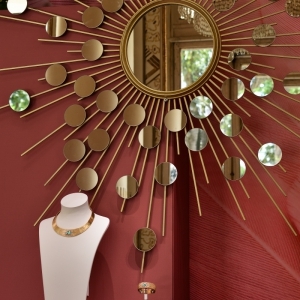 The House of Potocki is one of the wealthiest and most powerful aristocratic families that still exist in Poland. 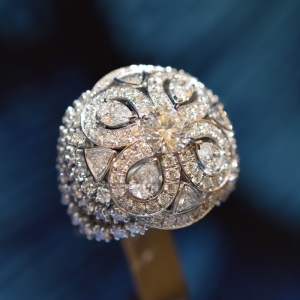 The heir, Count Alfred Potocki sold the hotel to the Paris Chamber of Commerce in 1923. 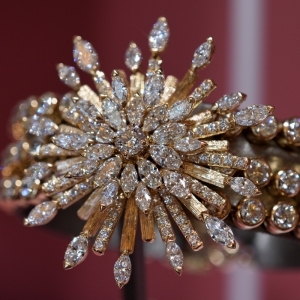 There were two major renovations, employing the era’s foremost talents: renowned French designer and Art Deco decorator Jacques-Émile Ruhlmann, the silversmiths company Christofle that exists still today, the modern classical French sculptor Joseph Bernard and the interior decorator Jules Leleu. 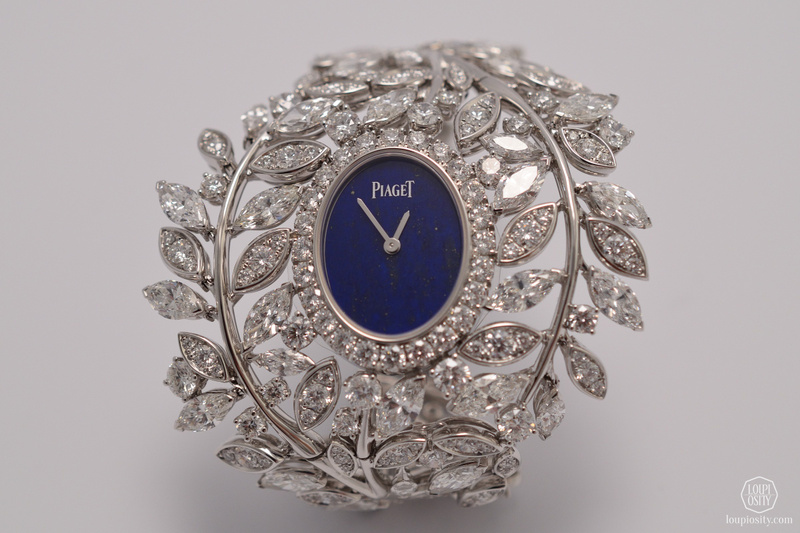 Piaget incorporated many of their signature marks on the jewellery pieces, such as the “Palace decor” which gives the gold a supple fabric-like appearance, the marquise-cut for the most radiant diamonds or versatility (removable and variable pieces as well as secret watches). 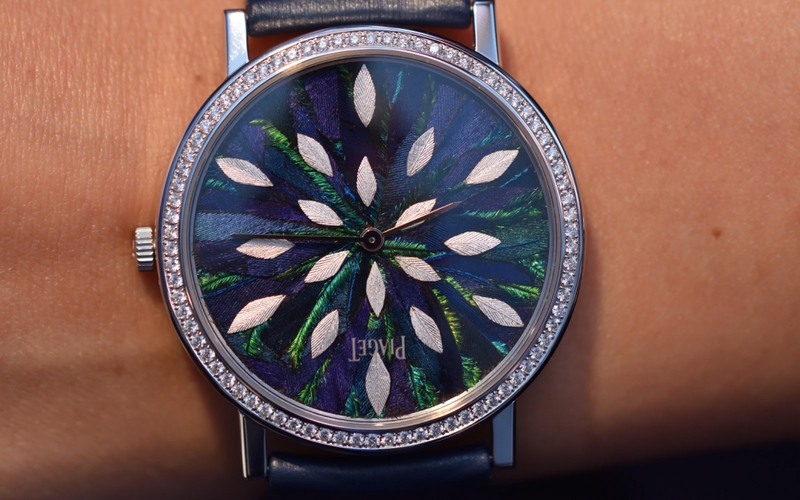 After the “Secrets and Lights” high-jewellery collection presented last year, Piaget has once again cooperated with Nelly Saunier, a “feather marquetry” artist (known as plumasserie in French). 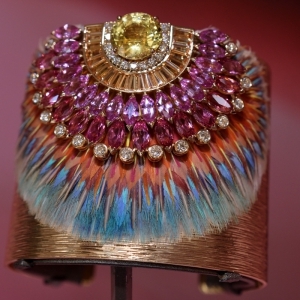 Nelly adorns various haute-couture and haute joaillerie pieces with feathers. 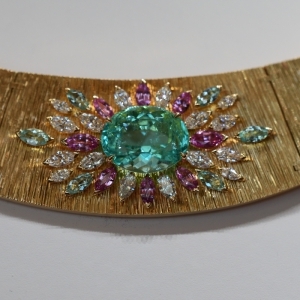 She was honoured by the Fondation Bettencourt Schueller with the Liliane Bettencourt Prize, which rewards expertise, creativity and innovation in the crafts. 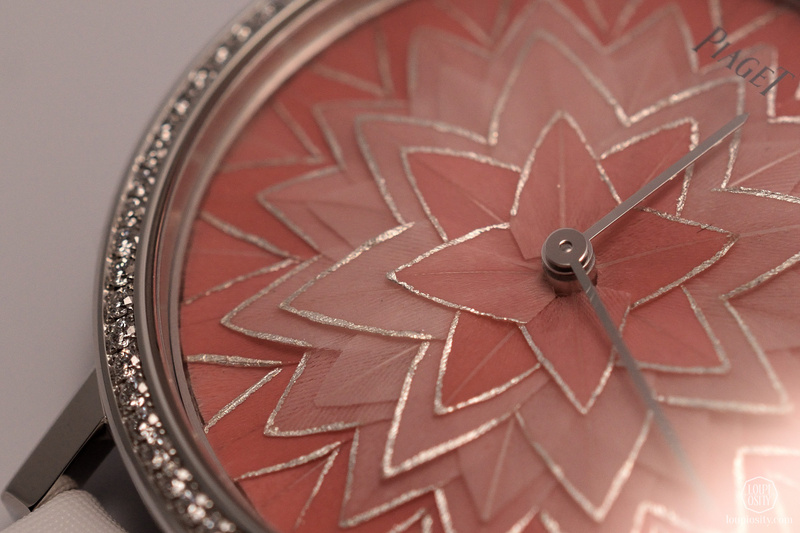 This year Nelly created cuffs decorations as well as a watch dial with feathers. 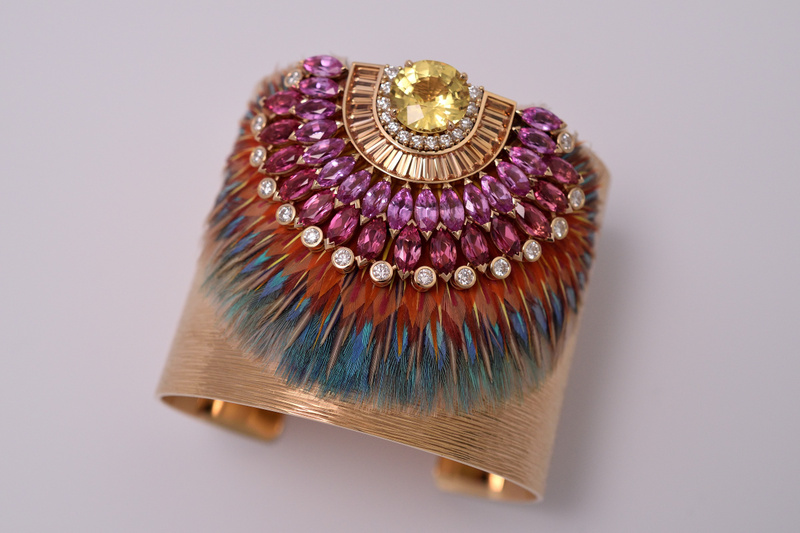 One pink gold cuff is decorated with the Palace pattern and a gorgeous colourful feather motif set with 1 round-cut unheated yellow sapphire from Ceylon (approx. 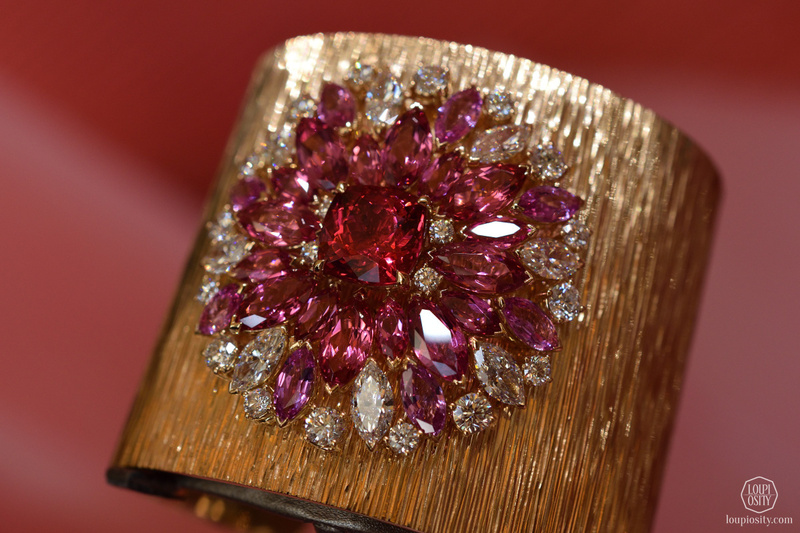 6.05 ct), marquise-cut red spinels, baguette-cut spessartites, marquise-cut pink sapphires and brilliant-cut diamonds. 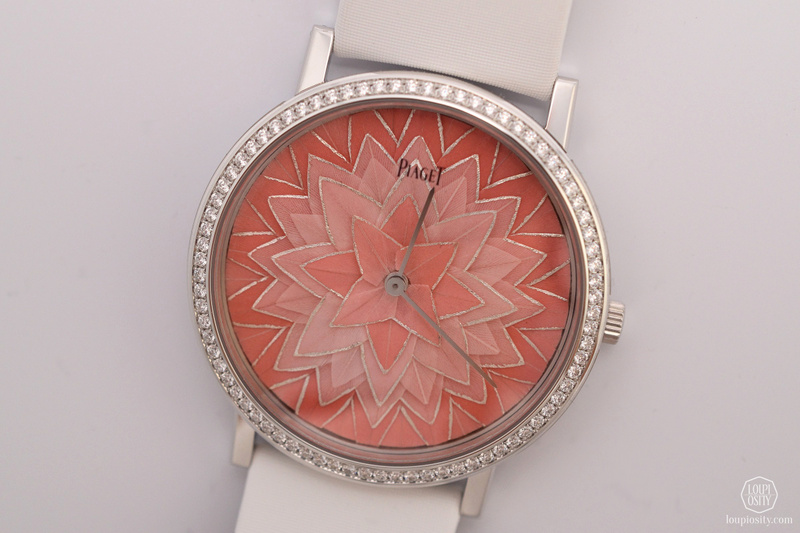 The white gold Piaget Altiplano watch (38mm) dial has flamingo-pink and white feather marquetry and a case set with 78 brilliant-cut diamonds (approx. 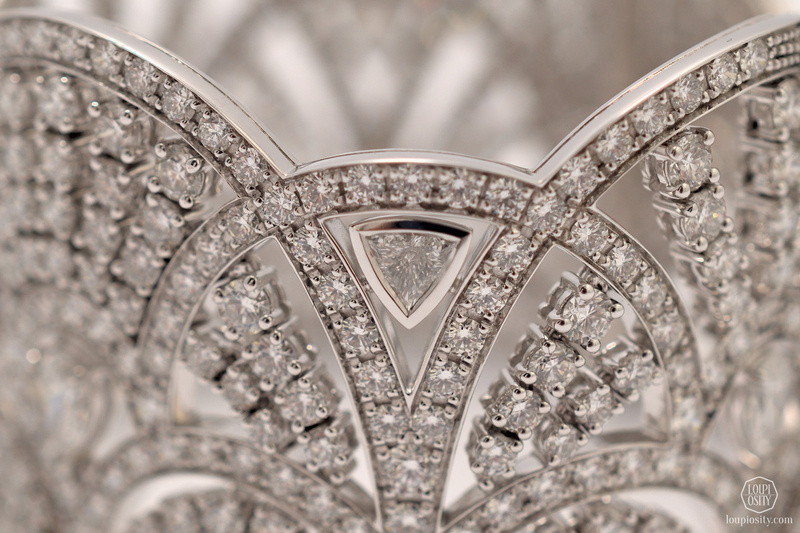 0.71 ct). 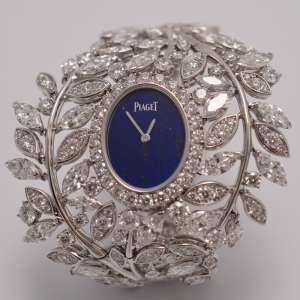 The timepiece is operated by the 430P Piaget manual-winding movement. 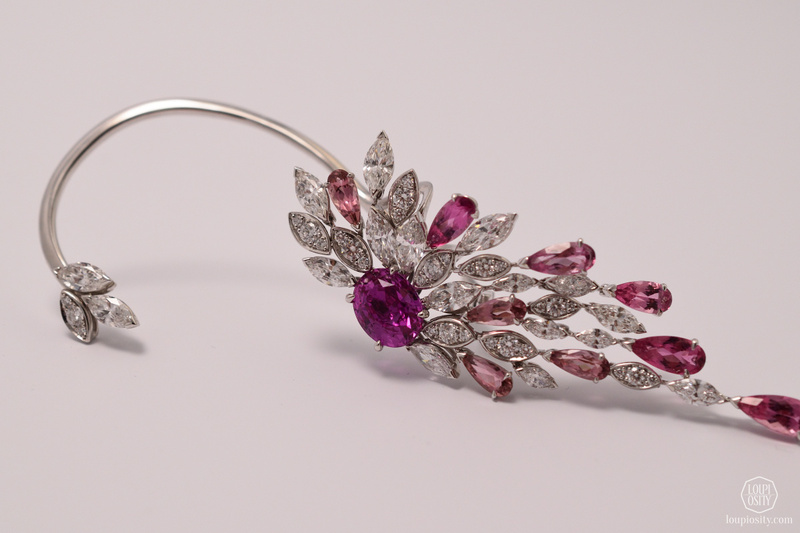 The Pink Plumage pair of earrings also recalls the feathers of a flamingo with its shape. 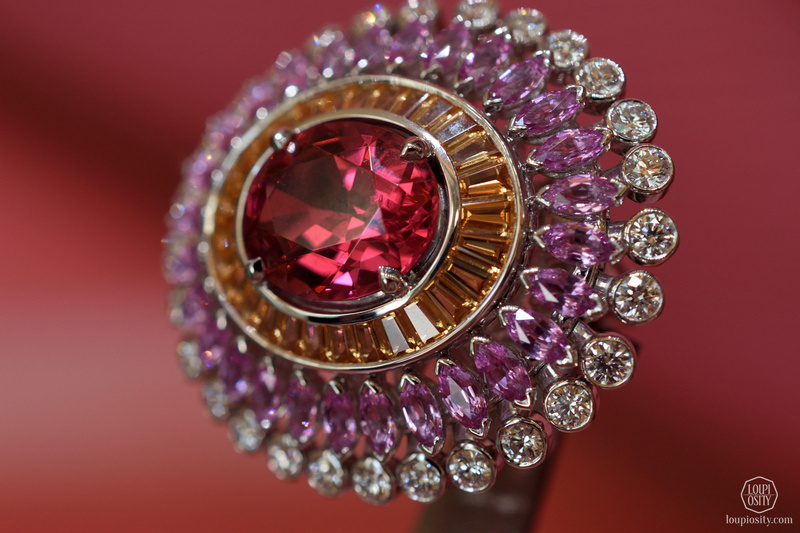 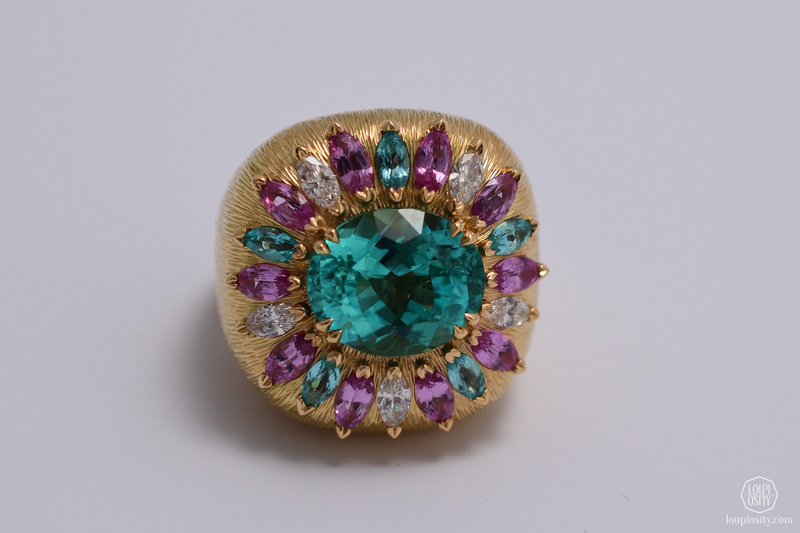 It is adorned by one oval-cut unheated pink sapphire from Madagascar (approx. 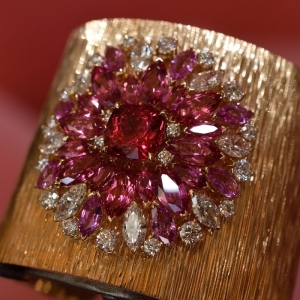 4.58 ct), 9 pear-shaped pink tourmalines (approx. 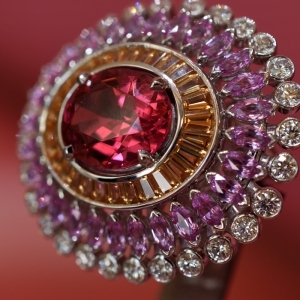 5.54 ct), 18 marquise-cut diamonds, 33 brilliant-cut diamonds and a marquise-cut pink sapphire (approx. 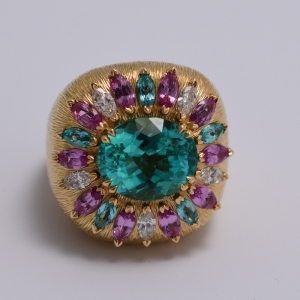 0.50 ct). 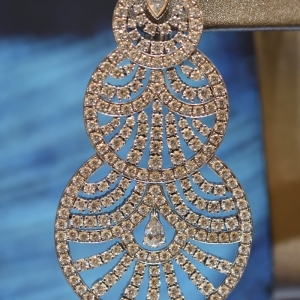 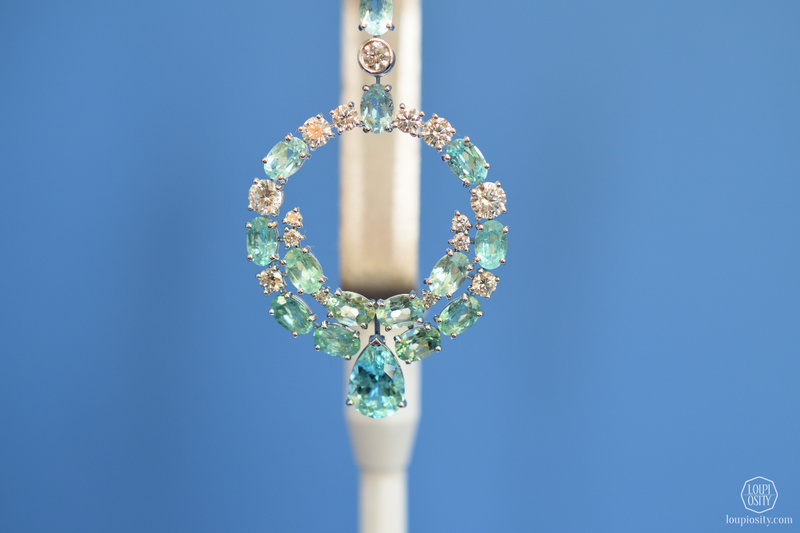 The piece is asymmetrical: the right side of the pair is a smaller piece, and the left side is a feather-shaped jewel following the line of the ear lobe. 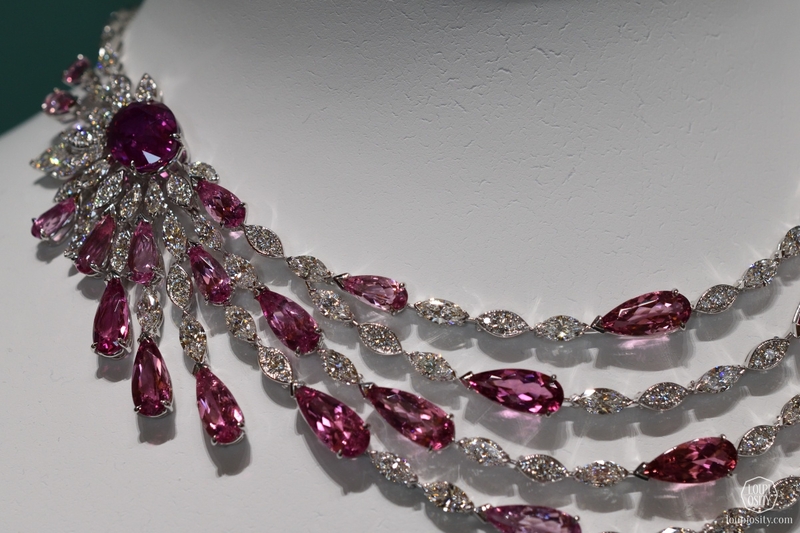 There is a great matching necklace with an unheated pink sapphire from Madagascar (approx. 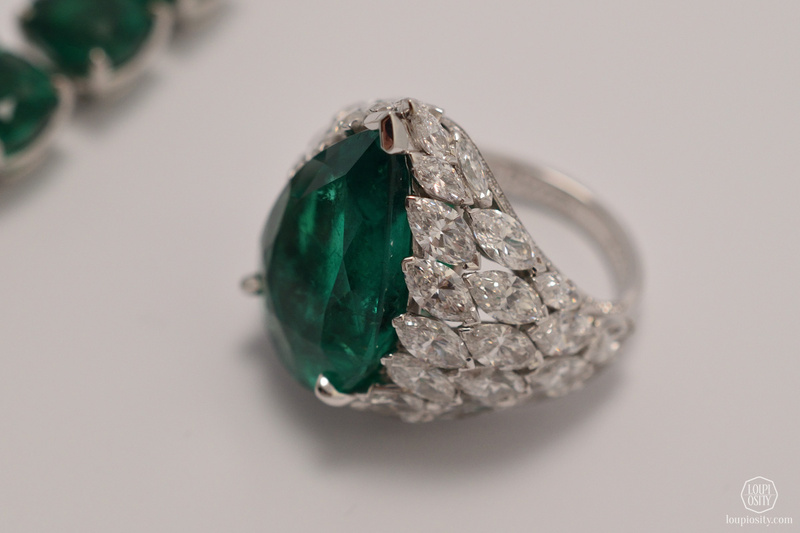 10.18 ct) as centerstone. 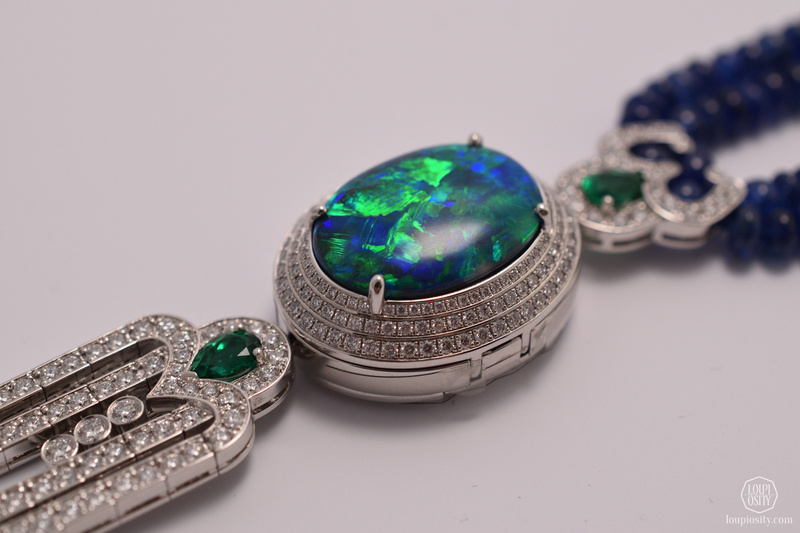 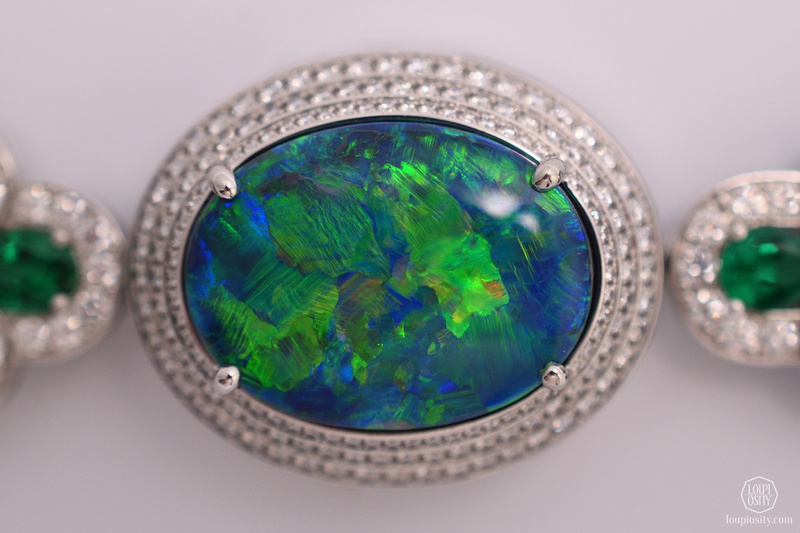 The centrepiece of the white gold sautoir is a cabochon-cut Australian opal (appr. 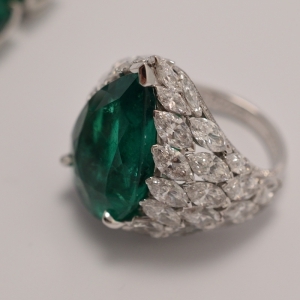 11.99ct) covering a secret watch. 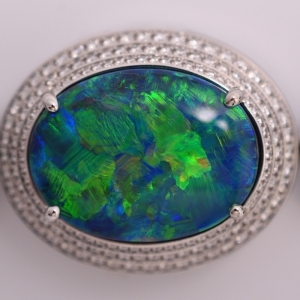 The shimmering colours of the opal evoke the wavy surface of the pool. 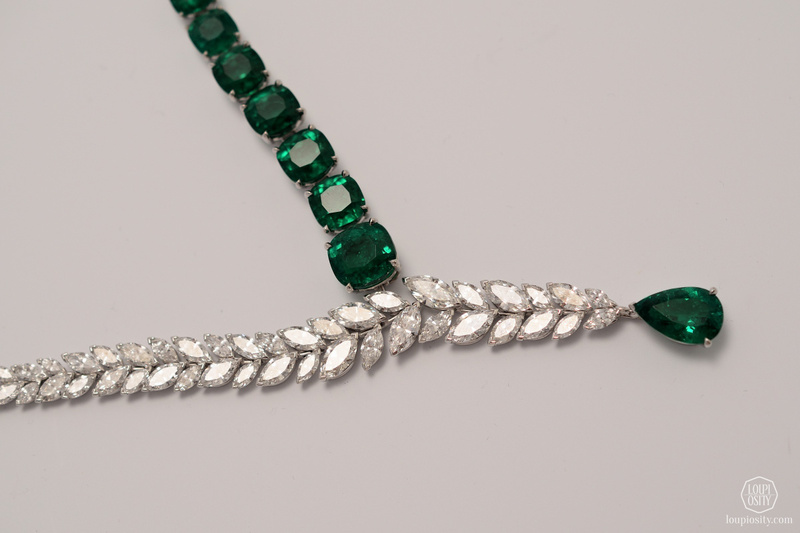 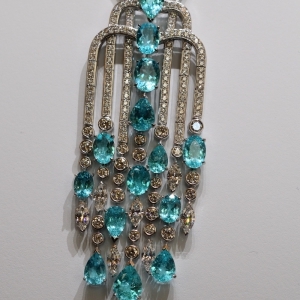 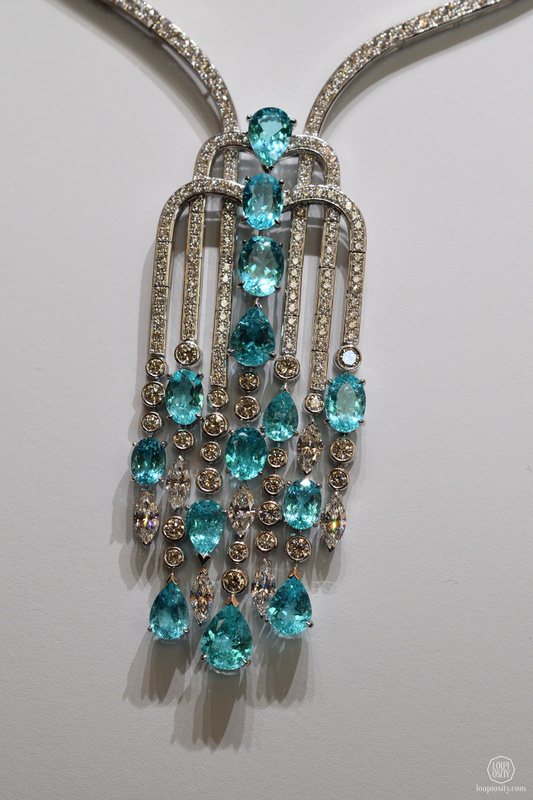 The necklace itself is composed of 349 blue sapphires beads, 6 pear-cut emeralds and 209 brilliant-cut diamonds. 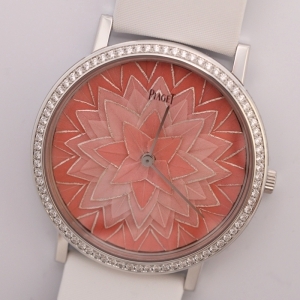 There are pieces in the collection which play with silhouettes and patterns instead of the colours. 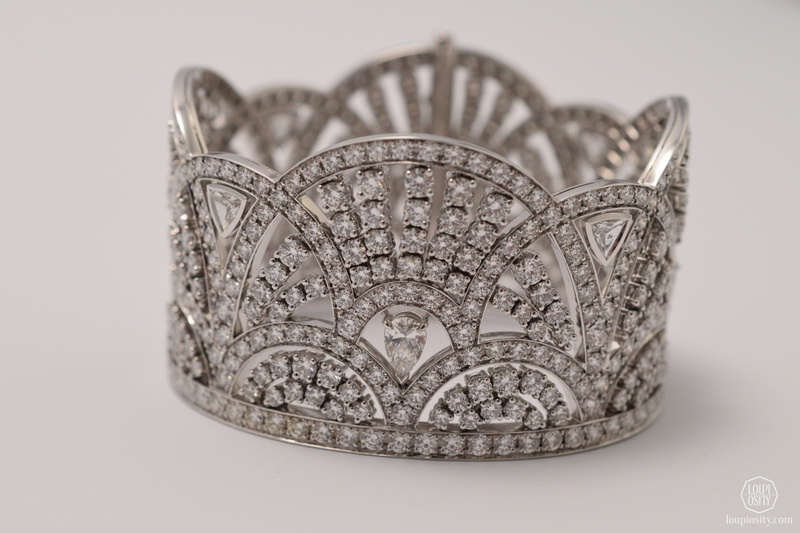 One of my favourites was a white gold manchette (cuff bracelet) set with 547 brilliant-cut diamonds (approx. 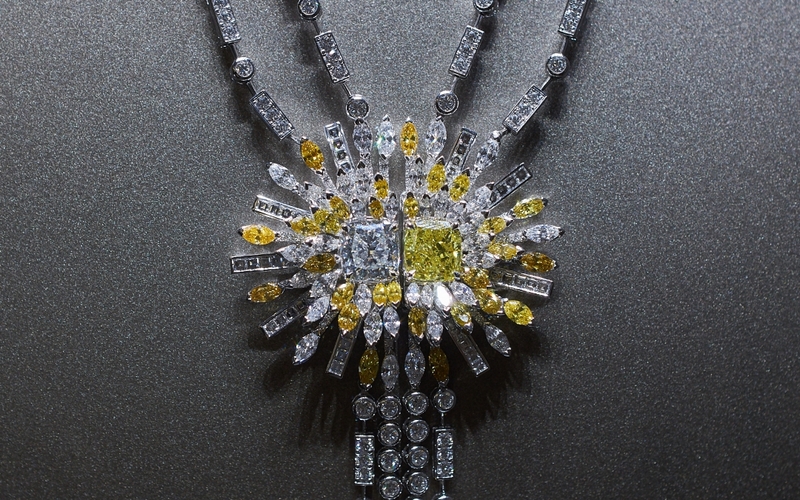 26.38 ct), 3 pear-shaped diamonds (approx. 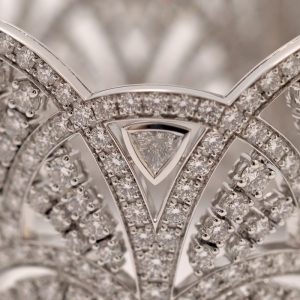 1.26 ct) and 4 triangle-cut diamonds (approx. 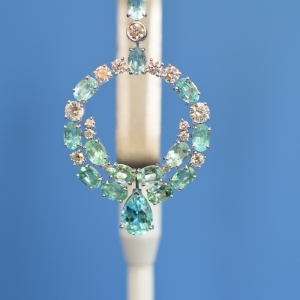 0.80 ct). 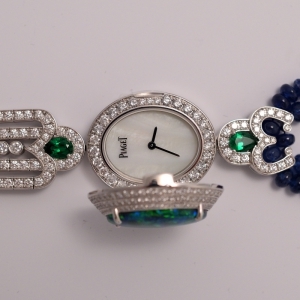 The motifs of the bracelet remind me of Art Deco graphics. 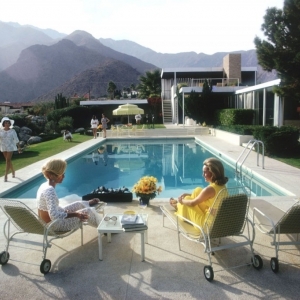 Photo credits: Slim Aarons ©, Julius Shulman ©, Nuvue interactive. 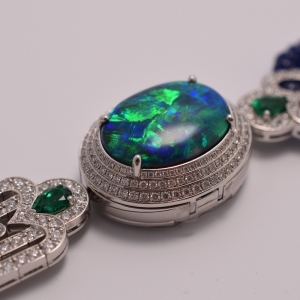 Loupiosity.com. 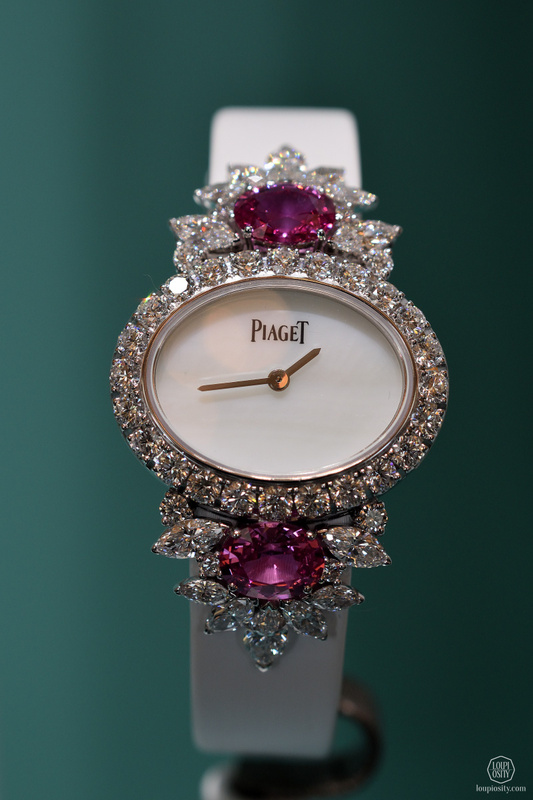 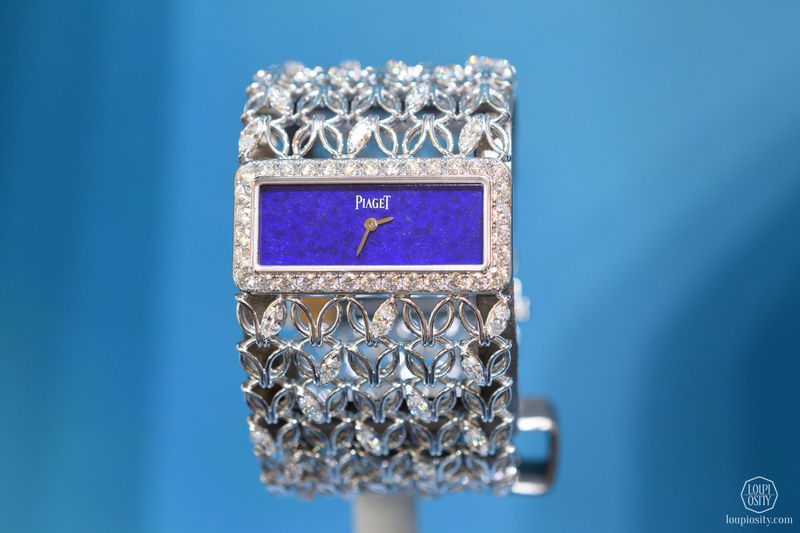 Piaget Sunlight Escape Piaget presented its latest chapter of High Jewellery, Sunlight Escape during the Paris Couture Week at the Piaget boutique on Rue de la Paix. 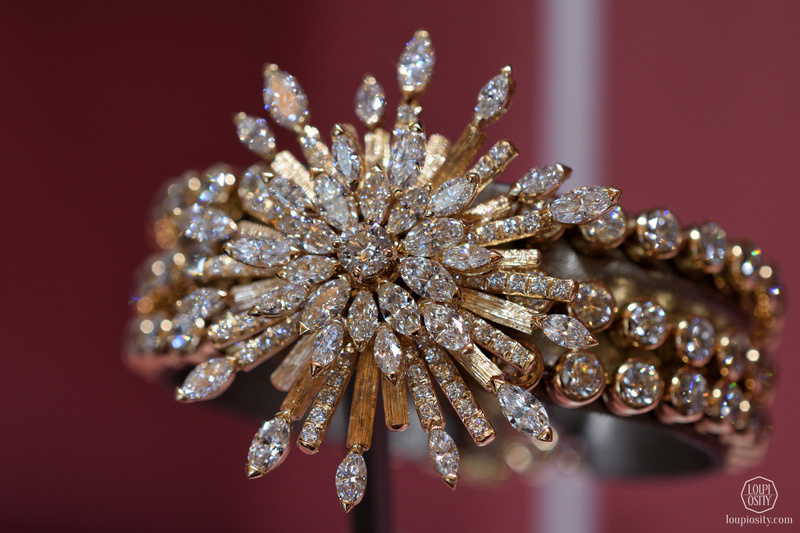 Chopard Red Carpet 2018 The Chopard boutique at the corner of Place Vendôme presented the dream runway line-up of 71 creations and we went to see them.